Gov. Inslee appointed Tumwater resident Bill S. Kallappa II to the State Board of Education in 2019. Bill has a combined 25 years’ experience working in public education, Parks and Recreation Youth Programs, Tribal Youth Programs and is currently the Director of the Education Department for the Nisqually Tribe. Bill oversees the Early Head Start/Head Start programs, works collaboratively with local school districts at the K-12 level and is responsible for working with higher education institutions for Nisqually Adult Education programs. Bill recently worked to establish the Nisqually Youth Council, a governing youth body that engages tribal youth in addressing issues that concern them. The Nisqually Youth Council is designed to imitate Tribal Council and is a legitimate organization complete with a resolution, constitution and bylaws. They have elected officials and a voting body that give a voice to Tribal Youth. 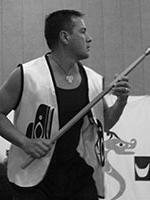 Bill is also proud to be a co-founder of the Inter Tribal League. The ITL is a tribal youth sports league that was established in 2009 that gives Tribal Youth access to playing youth sports. The ITL serves Boys and Girls in grades 3-12 in sports such as basketball, softball, flag football and soccer. The ITL has partnered with the Seattle Storm over the past 6 years to provide an annual youth basketball camp for Tribal youth. Bill serves as a Parks Commissioner for the city of Tumwater. He is also a member of the Washington State Indian Education Association the National Indian Education Association and serves on the Tribal Leaders Congress for Education. He is also the representative from the Governor’s Office of Indian Affairs to the Educational Opportunity Gap Oversight and Accountability Committee. Kallappa is a graduate of The Evergreen State College with a bachelor’s in interdiciplinary studies. Bill enjoys spending time with his wife Maia Bellon and teenage daughter Talia.